Shelley Bean: Embossing is the BOSS! I have to admit, it's been pretty fun the past few days, thinking and planning and scoping out new ideas to stamp. I have been a paper crafter for many years, including designing my own stamps, but admittedly, I didn't necessarily enjoy the process of stamping. (I know...it's quite shocking, really)!! 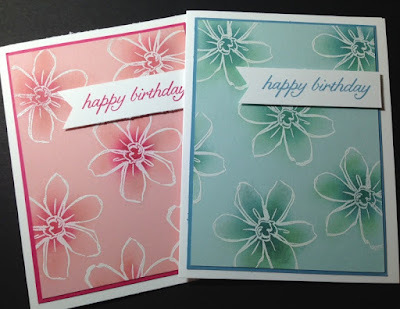 But these past few weeks, I have really, really enjoyed playing with all my new Stampin' Up! toys and getting my fingers all ink stained. It's awesome! Some times my creations are pretty and I like them and other times I just toss it aside. We all have a standard, you know? But one of the things I really have enjoyed is scoping out other blogs, pinterest and places where I learn new techniques. Sometimes I just have to try and duplicate the creation because it's so pretty, or fun, or just want to try! I ran across a blog last night that I knew I wanted to CASE her project. Her name is Angie, and I know I am going to have fun looking through her ideas. Here is one I had to try! Her example used different colored papers and inks, but I worked with what I had and I like the way it turned out. 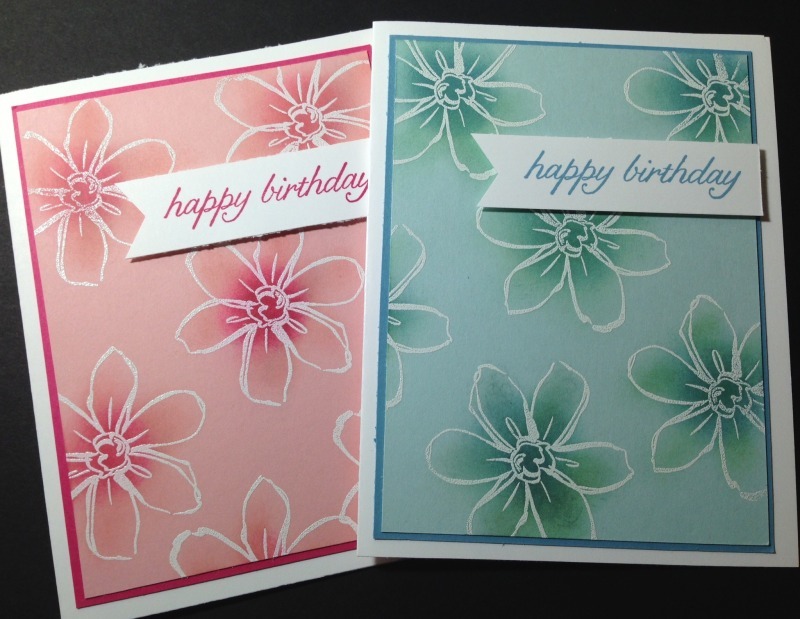 I embossed in white and then using a sponge dauber inked up the embossed images. Very fast and fun! Did you know that you can shop from my Stampin' Up store 24/7? If you place an order over $50.00 I will send you something special from me personally. If you place an order that equals $150 or more, you qualify for Stampin' Rewards and that means free products! Please look over the links at the top of my page because there are a lot of different options to consider.